Fueled up and READY FOR ACTION!!! 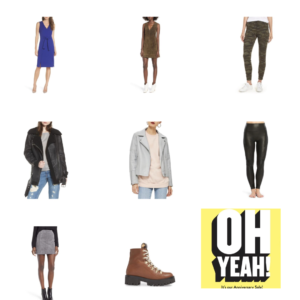 Ok, so I was super excited for the #nsale this year. 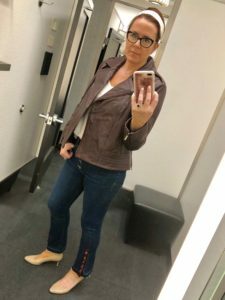 I have Like to Know it now (a cool way to shop my instagram), the best sales associates to help me curate my purchases at our local Nordstrom (thank you Jen and Marcie!! 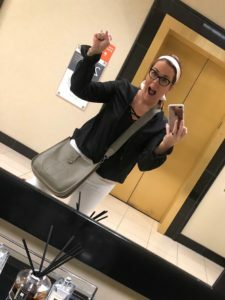 ), my experience as a stylist to share with you all, and a zero balance on the Nordstrom card. Seems like totally idyllic, right? 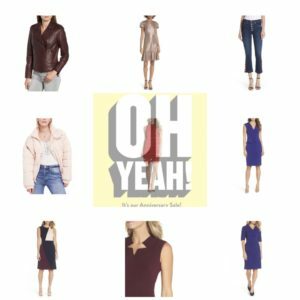 Some backstory–the Nordstrom Anniversary sale is the blogging world’s high holiday. Women all over instagram link their favorite finds into their feed, LTK.it and blogs. Followers of bloggers and stylists truly ask for this as a service to whittle down the enormity of the sale (like a “help me find the best pieces”). BUT there is some criticism out there as well. Are you a sellout for so heavily investing in this one event per year? Anyway, I’ve been a fan of the sale as long as I can remember. My first few years going, it was a thrill to find gorgeous handbags, leather ready-to-wear, and SHOES galore at PRE-SEASON low prices. Use your Nordstrom card and you also have early access to the sale (before it opens to the public) and earn points toward nordstrom notes (cash back to spend in the store). It’s been a great way to stock up on basics (the white tees that need replacing each season) and add some cool new pieces. I had my list ready, my morning latte, and hit the store the first day I could. Some of my favorites. You can click the photo to shop them and those below too! My 15-year-old came with me this year. He’s a bit of a shopper and style guy as well, so I thought it would be fun. As we did an initial walk-through, I explained to him the strategic benefit to both Nordstrom AND the consumer. Remember, I grew up in department-store retail and know more than the average consumer. For you, the consumer, it is an opportunity to shop the upcoming season’s styles at the discounted price BEFORE the season starts. Advantages include full inventory (no sold out product), great selection, and of course, fabulous prices (usually about 40% off). When the sale ends, prices pop back up to retail and those are printed on each price tag. Wait until September markdowns and you likely won’t find much left. For Nordstrom, the benefit is FAR greater. Designers produce special items for this sale, adding in additional margins (profit) for themselves and Nordstrom. Say, for example, an item retails for $100. The initial, typical profit for that item is 50%. At half off, a retailer is still covering their costs. Many vendors have a 50+10% margin that builds profit in, even at a half-off sale. Keeping this in mind, it is probable that the items in this sale are making the 50% (or close) profit EVEN AT THE SALE PRICE. When the sale is over, the remaining items pop back up to “retail” which they honestly don’t expect people to pay. That is a happy accident when someone does. This doesn’t mean it is a bad idea to shop the sale. I’m a HUGE fan, but I want to educate, as a stylist, how to shop with VALUE for you, the consumer. Have you ever been to, say, the Michael Kors or Coach outlet? 95% of the product in those factory outlet stores is produced specifically for those stores. This isn’t deep discount of what didn’t sell–It is produced at full markup (via lower cost of design and materials) to lure the consumer into a false sense of bargain. [general rule–If it says “factory store” that is NOT FIRST RUN DESIGNER GOODS USE CAUTION] Nordstrom’s vendors produce sale-exclusive product for this event. Throughout our store, I encountered lower-than-expected quality. THAT was HUGE disappointment to me. I was STOKED and let down. Additionally, the early access sale requires a Nordstrom Credit Card. By enticing consumers with the Nordstrom notes and early access, they dramatically increase their participation in their credit card program. Customers who don’t pay off the balance on time will be charged HUGE interest and they’ve just made all their money back. I love having the card and their notes program, but PAY IT OFF!!! I DAZZLED T-bone with the business of this sale and he took a far more critical eye to the product as we shopped. This jacket and jeans are TO DIE FOR. Buttery leather moto in burgundy matches the trim of these jeans. Both linked below. Our local Nordstrom is not a super-high volume store, even WITH my presence (hahahahaha! ), and our selection was meh. I would address Nordstrom corporately here to suggest that if they EVER want their lower volume stores to BE higher volume, they need to up the #nsale game. Our location was STOCKED with little diversity–racks and racks of jeans and flannel, fitness wear and UGGS. It felt like a GIANT JUNIOR department. Perhaps our store HAS the American Eagle crowd doing most of the shopping. If you want her MOM to buy things, you need to put it on the rack. Nordstrom corporately has opted for a safe formula in this location. Bring in only what is guaranteed to sell. Very little was done this year to make their top-tier, early access clients feel special at all. It felt very much like they are so happy to have the world of bloggers just promoting it online everywhere that the stores themselves don’t matter. This is not only unfair to customers, but seriously hurts their sales associates. I saw women walking away with nothing this year, and that is a real shame for those who spent hours working the sale. As a stylist, I am hesitant to take my LOCAL clients there and will likely curate proposals virtually. That said, I found a TON of items I love on the website. I am linking a bunch here. There were super dresses for working women at FANTASTIC prices (as in under $100), beautiful leather jackets (for those dresses maybe? ), and some fun trend pieces to try as well. Scroll down for the photos and links…. Remember, I adore Nordstrom generally. But I would be inauthentic as a stylist if I simply drank the Koolaid of this sale and asked you all to do the same. Make a plan, assess your real NEED and the QUALITY of the item for the price offered, and happy shopping! Still not sure? I would LOVE to work the sale WITH YOU, and am offering a special promotion to do so for only $50!!!! No matter how much we put together. Contact me for more information! 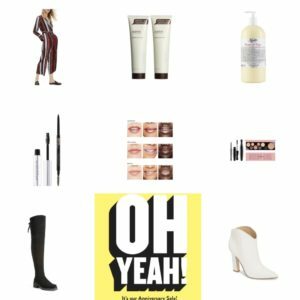 Click the photo for links to my favorite stock ups, beauty, and trend. TONS of gorgeous real and faux leather/suede moto jackets. Spanx moto leggings and more…linked in the photo, just click. My very very favorite…for today. 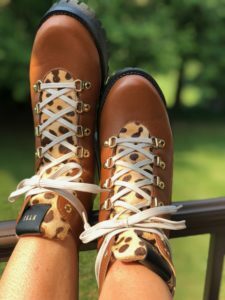 These calf-hair lugg boots are under $100 and a perfect fall neutral. Linked in the photo.